Oracle Engineered Systems are architected to work as a unified whole, so organizations can hit the ground running after deployment. Organizations choose how they want to consume the infrastructure: on-premises, in a public cloud, or in a public cloud located inside the customer’s data center and behind their firewall using Oracle’s “Cloud at Customer” offering. Oracle Exadata and Zero Data Loss Recovery Appliance (Recovery Appliance) offer an attractive alternative to do-it-yourself deployments. Together, they provide an architecture designed for scalability, simplified management, improved cost of ownership, reduced downtime, zero-data loss, and an increased ability to keep software updated with security and patching. 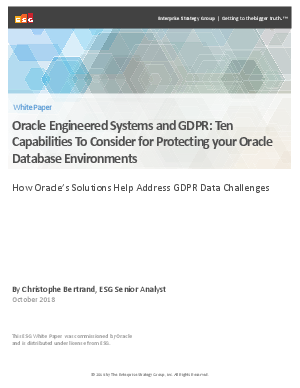 Download this whitepaper to discover ten capabilities to consider for protecting your Oracle Database Environments.